The server is not operational. If the PDServer (and secondary PDServer) is not operational, the users will not be able to log in to the printer. In order to allow them to use the printer, enable the Public User. It can be disabled once the server is back online. To allow scanning without login. Since there is negligible unit cost for scanning, some clients do not wish to record (or charge for) scanning. In this case, users can log in for scanning without having to enter their authentication details. The Public User can be enabled, and then its functions restricted to only allow scanning. This prevents users from photocopying using the Public User. To allow printing. Some sites may use datastream interpretation as their print tracking method. Under this method, the print jobs are not authenticated when they arrive at the printer. The jobs are still recorded provided they are sent via queues that are tracked by PDAgent. As long as Print without authentication is set to Allow on the printer, the jobs should print. However, the printer drivers must have their User Authentication set to disabled. If the drivers have the Auto settings checkbox selected, the User Authentication option will be automatically set to Enhanced Server. This means jobs will arrive at the printer under the Public User. The printing function for the Public User must be Allowed, otherwise the printer will delete the jobs. At the printer, press the Menu button. Enter the Administrator password and touch OK.
Touch User Authentication / Account Track. Touch ON (With Login) (unless you want the Public User to stay logged in because the server is not operational then use ON Without Login). 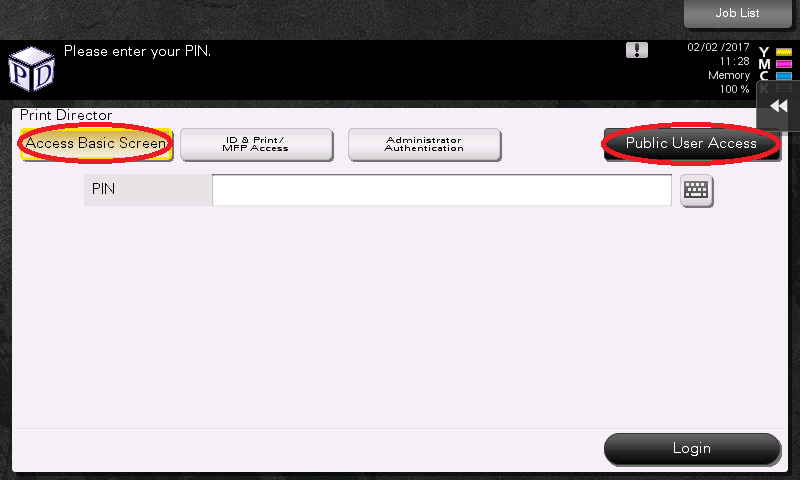 Once the Public User has been enabled, an extra button will appear on the login screen – Public User Access. 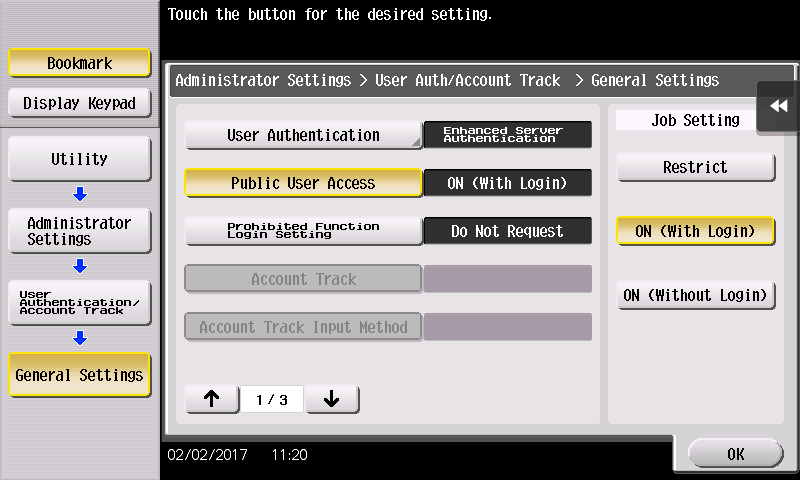 To enable this button, the button Access Basic Screen must be selected first after which the user will be able to select Public User Access. Enter the Administrator password and touch Login. If you do not want the Public User to be able to photocopy, touch Restrict for the Copy function. If you want the Public User to be able to Scan, leave the option Full Colour/Black selected. Otherwise touch Restrict. Touch the down arrow to move to the next page. If you want the Public User to be able to print (because of datastream interpretation print tracking), leave the option Full Colour/Black selected for the print function. Otherwise, touch Restrict. If the printer is mono, the option will be Allow or Restrict.